Holy Centre of Myanmar. Spiritual Heart of the Country. 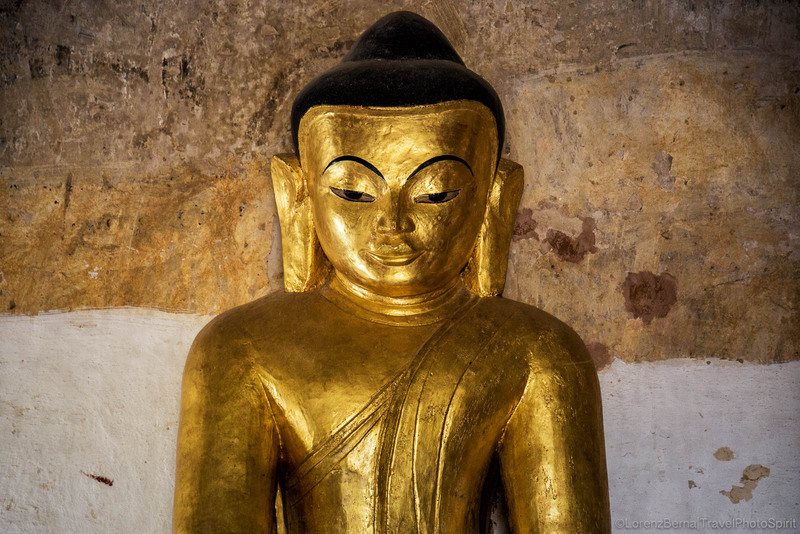 The wide and captivating Temple Area of Bagan is a total must for all visitors in Myanmar. 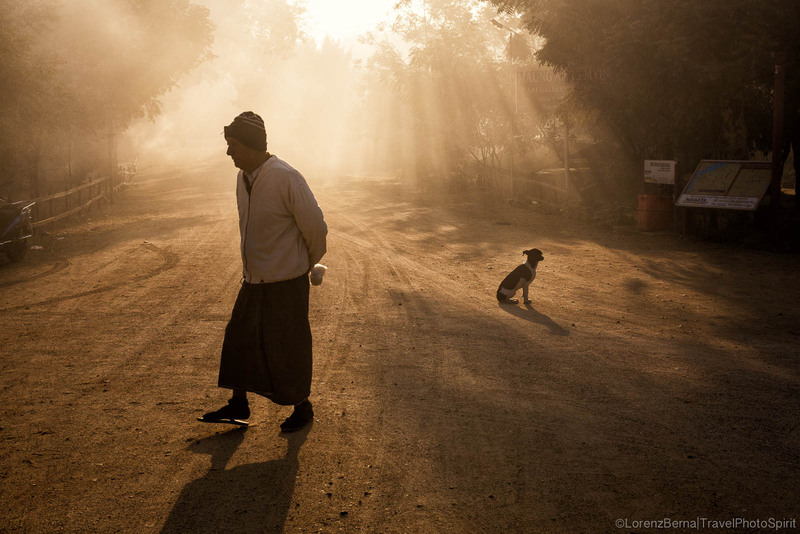 A jump in the Burmese Culture, a jump in its spiritual roots, a jump in Time. 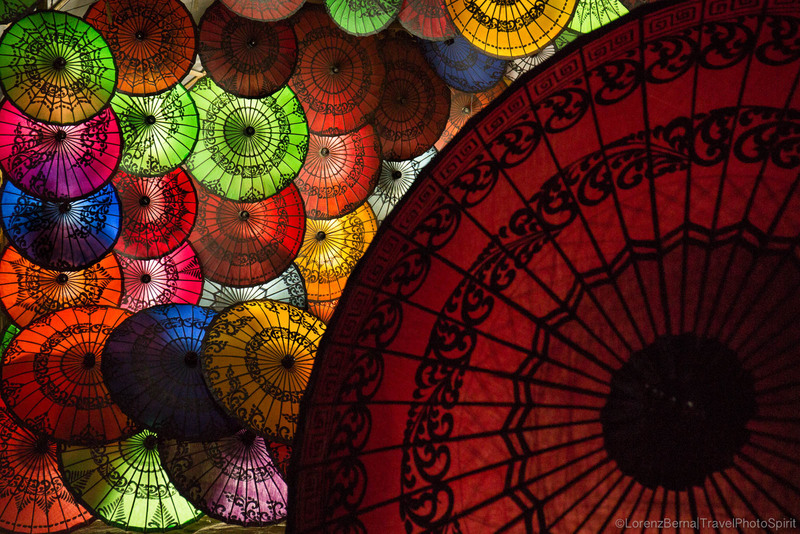 There, you circle the area the whole day, discovering the thousands of buddhist pagodas made of brick and stones. From one side, the famous ones signed on the touristic maps, from the other side, the hidden gems known only from the locals and the more adventurers souls. In Bagan, you lose notion of Time, of Space. You enter in a timeless bubble where you can easily spend a whole week, from early mornings to late sunsets, finding your way through history and cult. Allow yourself to Contemplation in front of one of the gigantic statue of Buddha, in front of the harmony of the temples architecture. In and Out : a perfect place for inner observation alongside photography. If you had very few days for a trip in Myanmar, you could just go in Bagan and you’d find its chore, its deep essence. 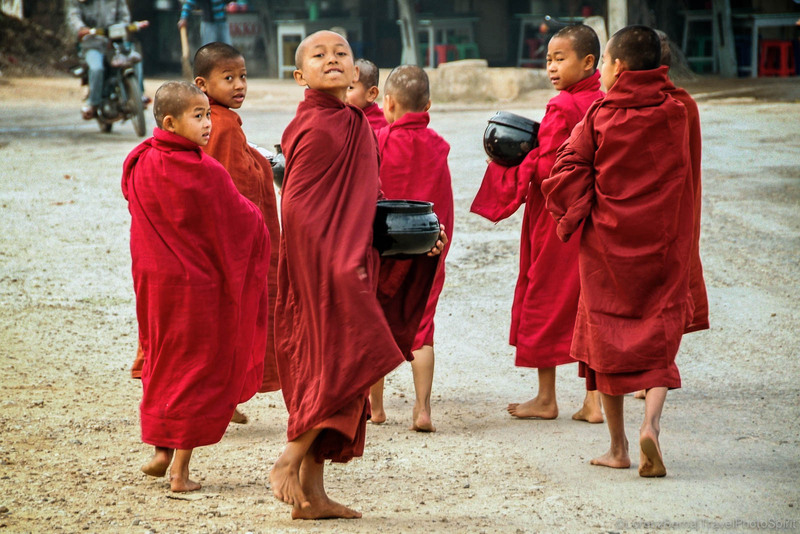 You would have everything you can hope to in Travel Photography : rural context and scenes, traditional people and handicrafts, lines of monks going for daily alms-round across the villages, holy temples, river, local life, markets and street foods. 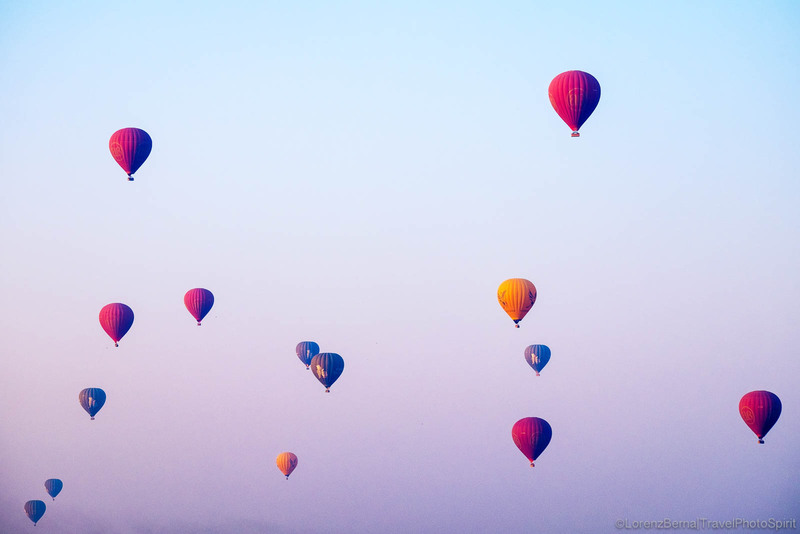 And for the most fortunate, a trip on a hot-air ballon over the temple area for an unforgettable sunrise! 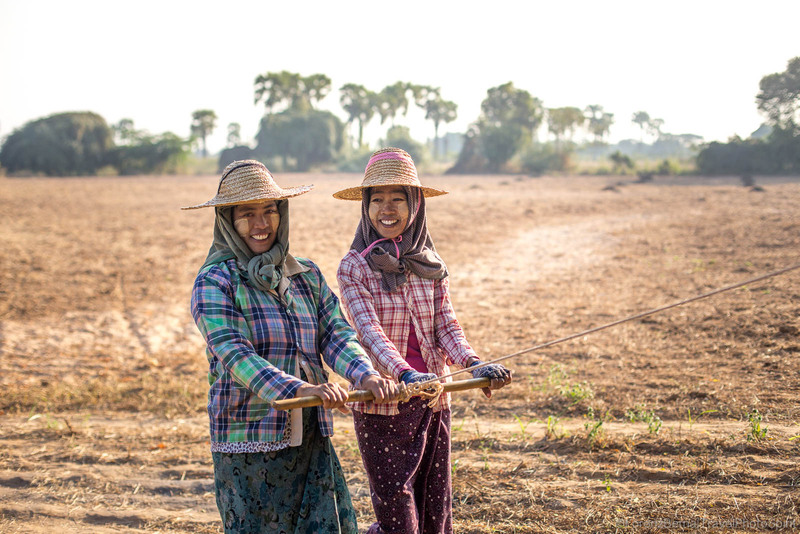 Portraits, Architecture, Street Photography : you find everything in Bagan, making a great set for an absolutely exotic Travel Photography. 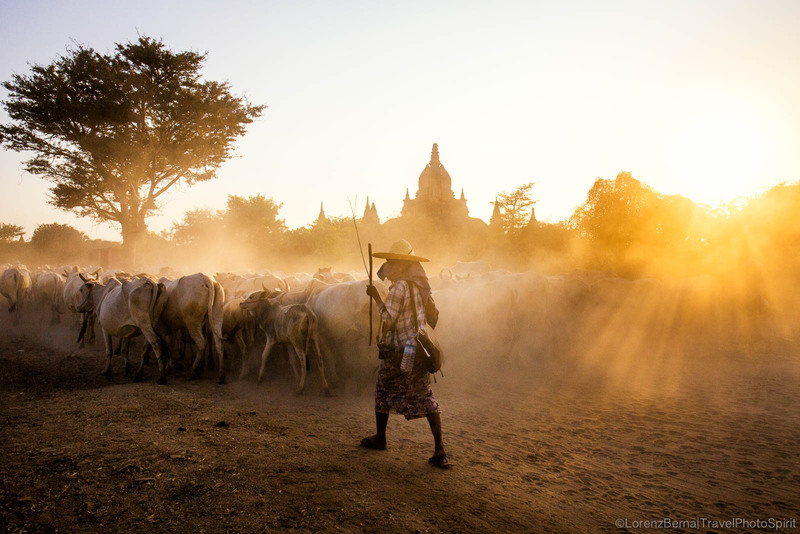 Farmer guiding her cows to the fields in Bagan temple area. 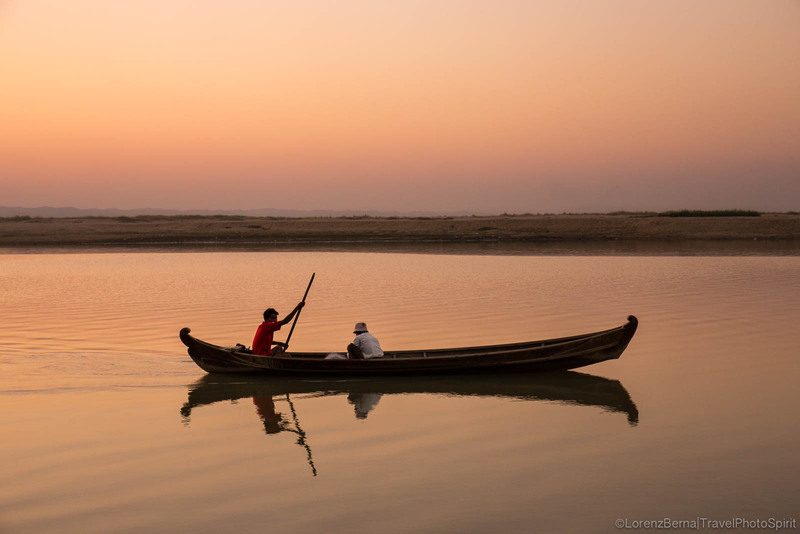 Two friends are sailing on a wooden canoe at dusk on the calm water of the Irrawaddy River. 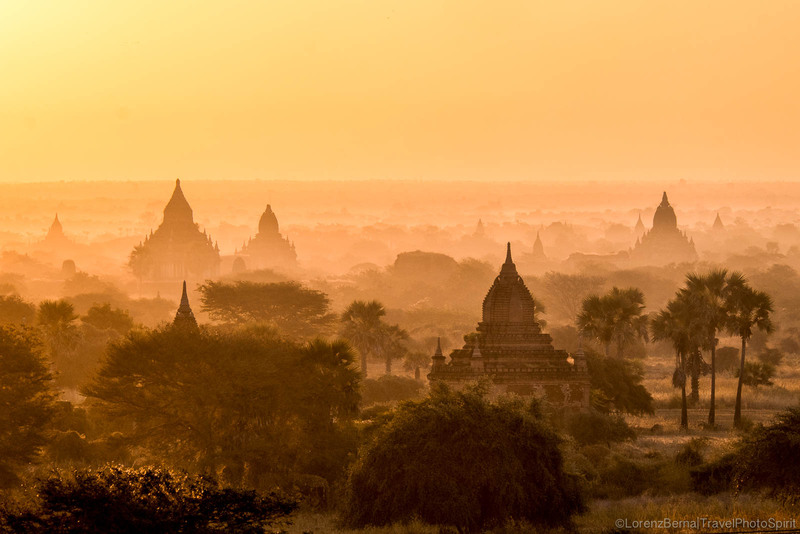 The Bagan temples valley at dawn. Hot Air Ballons in Bagan, for the transport of tourists on sunrise tours. 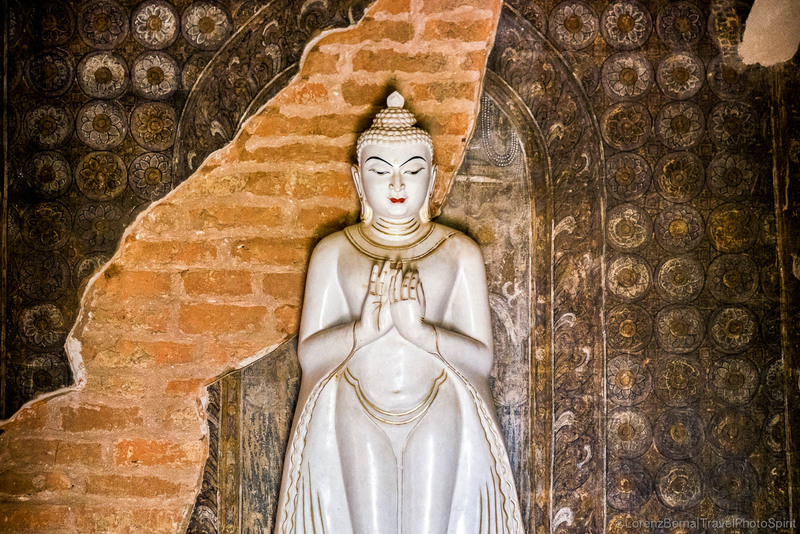 Detail of a statue of Buddha set along an old painted wall inside some pagoda. 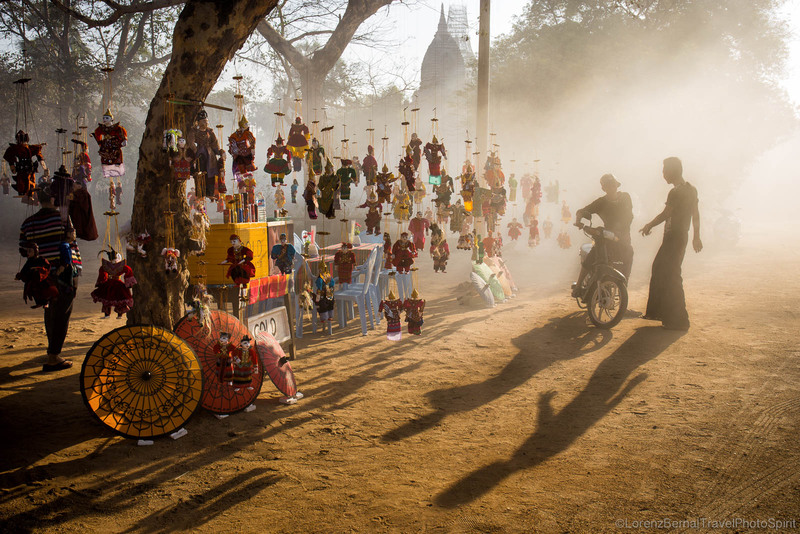 Silhouettes of young Burmese Boys in front of a street stall of local handicraft in Bagan Region. 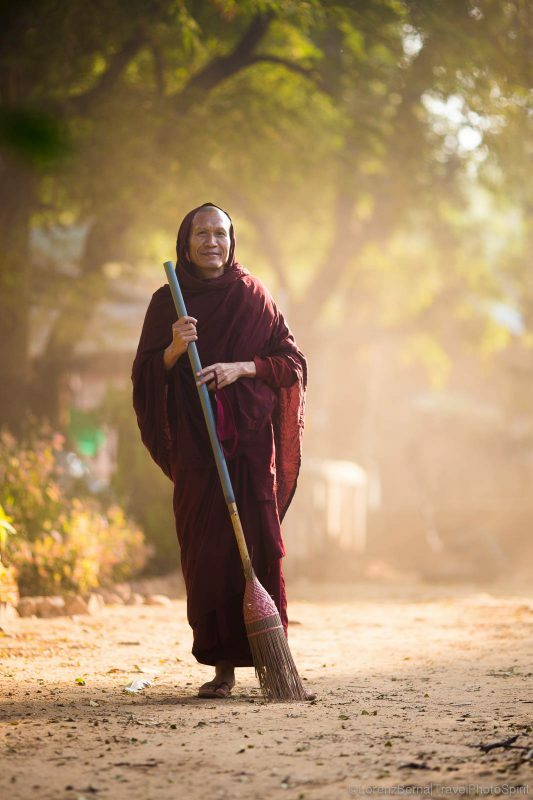 Portrait of a Buddhist monk on his duty of sweeping outside the temple. 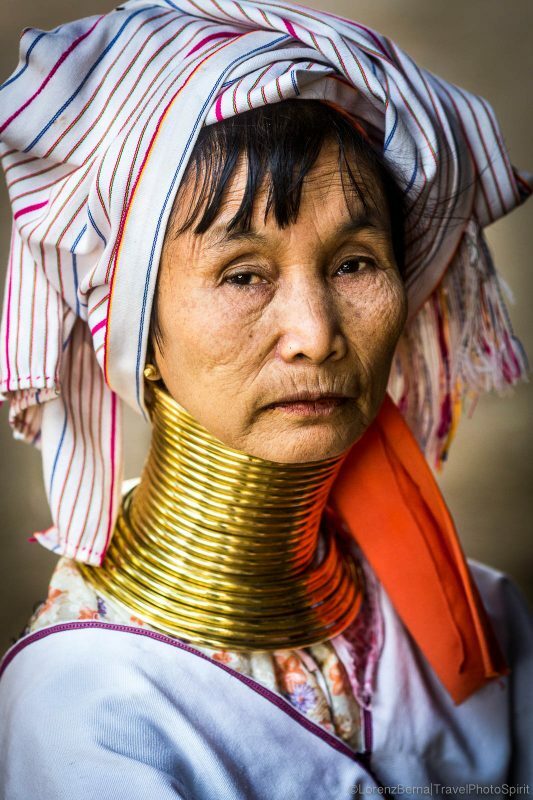 Portrait of a traditional Padaung Woman, commonly called "Giraffe woman". 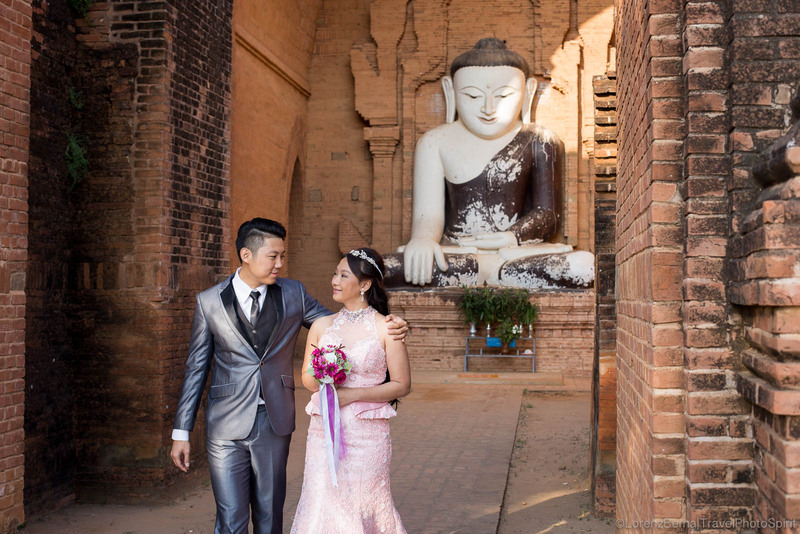 After having worshipped the Bhudda inside the Phyathada Pagoda in Bagan, this just married young couple is on their way to celebrate the wedding with their family & friends. Golden statue of Buddha inside of a temple. Young monks on an alms giving. Burmese woman smoking local tobacco. 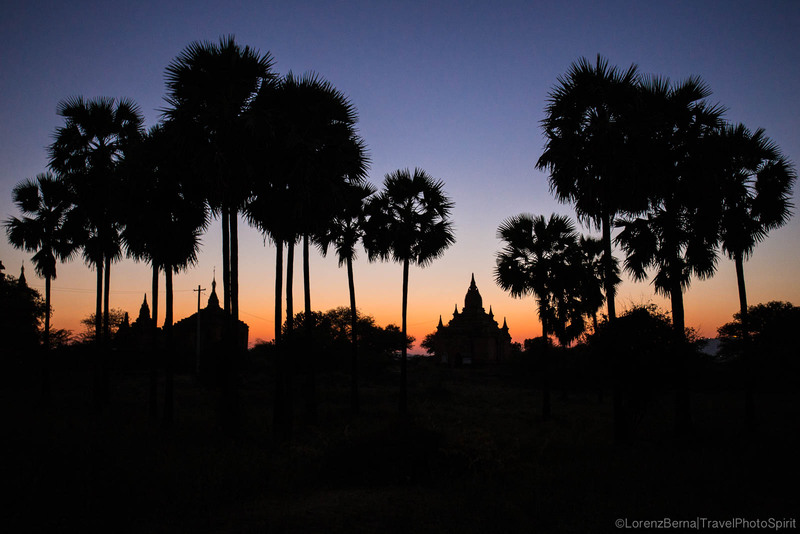 Silhouettes of pagodas and tall palms in Bagan, at dusk. 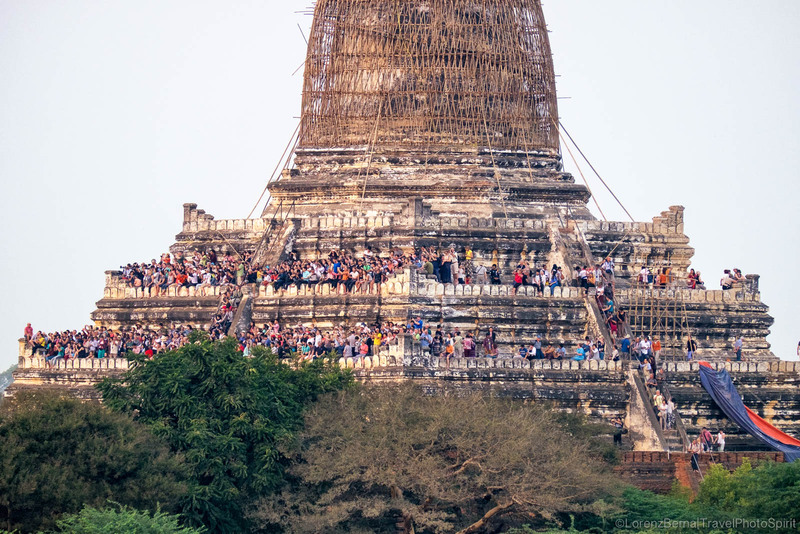 Crowd on Shwesandaw Pagoda for sunrise. 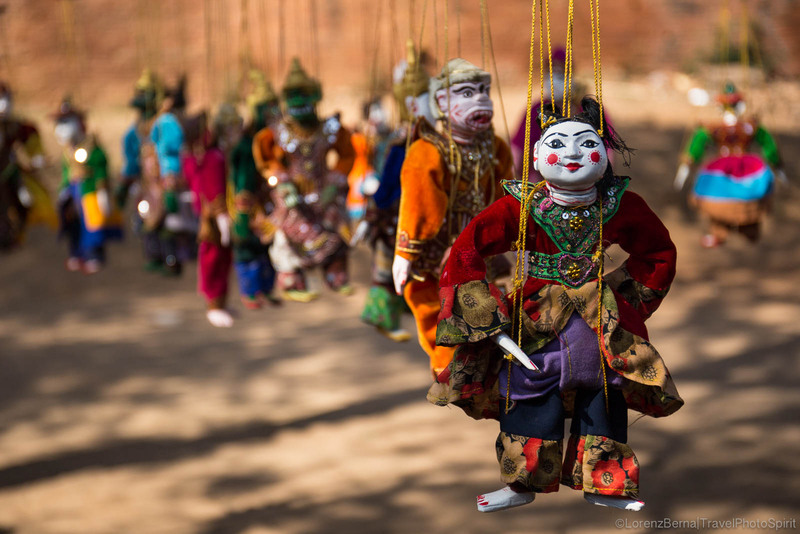 Local handicraft hanging all around Bagan Temple Area. 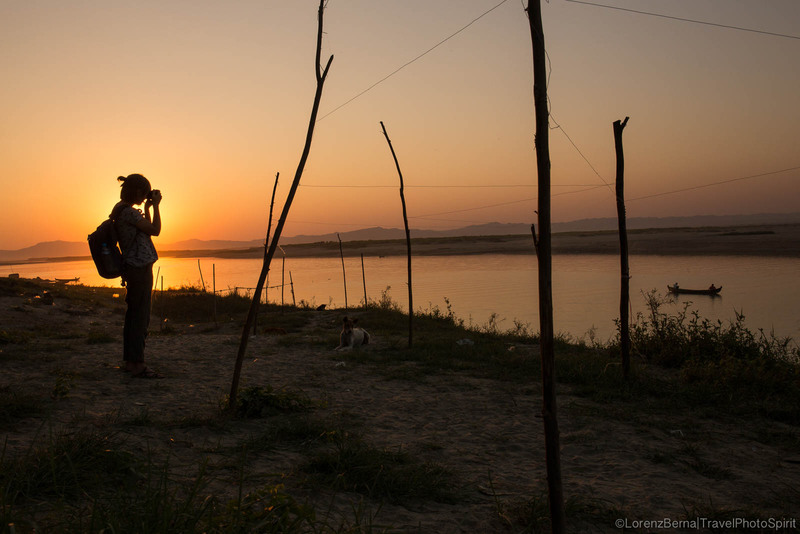 Sunset photographers on the riverside of Bagan. 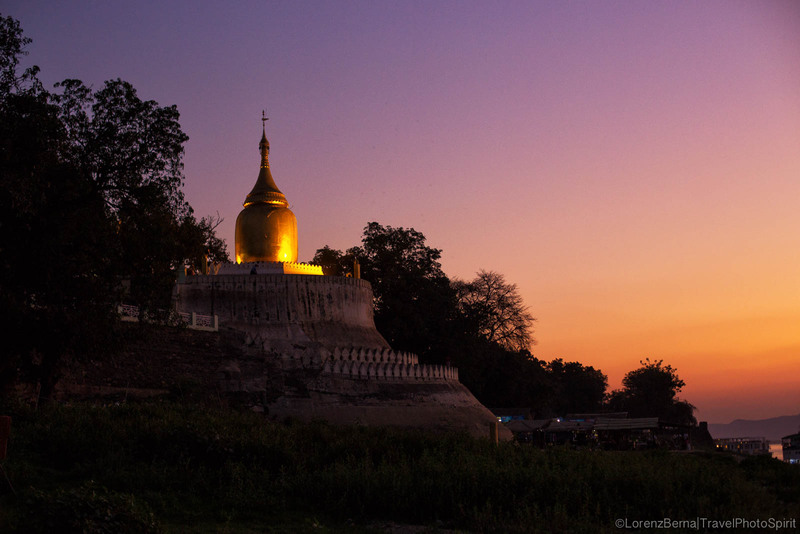 Bupaya Pagoda at the Blue Hours. 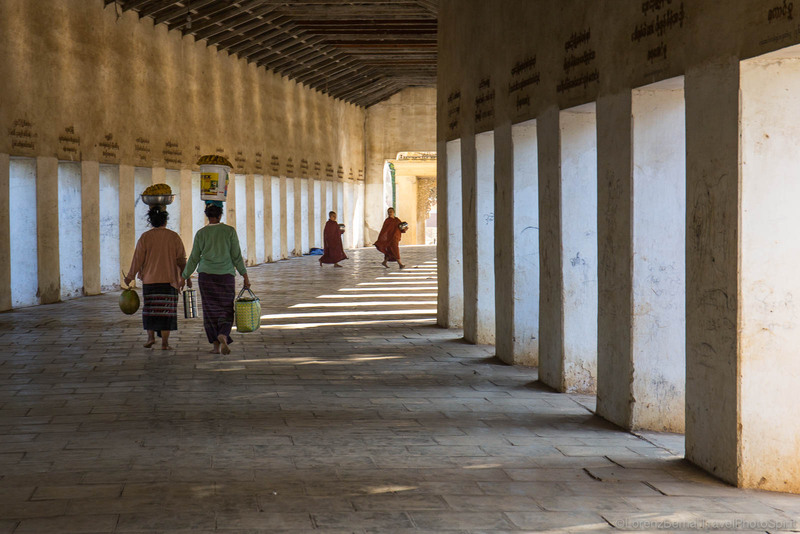 Local people and monks in the long walkway leading to Shwezigon Pagoda. Street scene in the villages, within the early lights of the mornings. 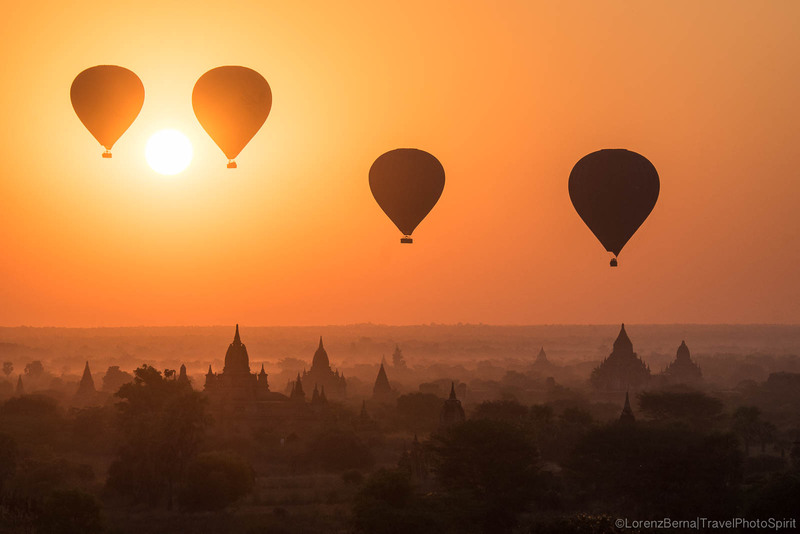 The hot air balloons rising over Bagan Temples area at sunrise with the morning mist covering the ground, are really an iconic and unforgettable view.